CAPTION: Three military veterans were awarded Missouri Returning Heroes scholarships by Grand River Technical School on Thursday. 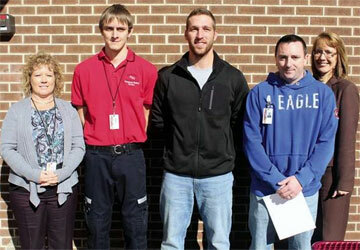 Pictured, from left: Marla Harrington, GRTS Financial Aid Coordinator; Patrick Stufflebean, Army, Paramedic student; Aaron Roberts, Army, Building Trades student; Nicholas Norman, National Guard, Industrial Maintenance; and Jayme Caughron, GRTS Director. Millions across the nation are honoring the service men and women of the armed forces on this Veterans Day with school assemblies, free meals and the distribution of poppies. One Chillicothe school is helping young veterans continue their education. On Thursday, Grand River Technical School awarded three Missouri Returning Heroes scholarships to students who had enlisted in the military and served in a combat zone after Sept. 11, 2011. "Those veterans that we have in training now who served in a combat zone during that time period were honored with a $1,000 scholarship," GRTS Financial Aid Coordinator Marla Harrington said. The three scholarship recipients are Nicholas Norman, an industrial maintenance student who served in the National Guard; Aaron Roberts, a building trades students who served in the Army; and Patrick Stufflebean, a paramedic student who served in the Army. GRTS currently has seven military service veterans enrolled at the school, as well as numerous others active in the National Guard. This page updated by BK Web Works 11/30/2013.